Parents usually look forward to their child’s first birthday. It’s a pretty big deal you managed to keep the baby alive, and feed yourself for that matter, for an entire year! Throwing a huge celebration is something many parents choose to do to acknowledge this milestone. But for those of you who have experienced this monumental event, you also deep down are quite aware that the party really wasn’t for the 1-year old, but was for YOU. The memories of their first bite of cake (that’s really not their first bite, but we can pretend) will be forever engraved in your mind. All of your closest family and friends come from near and far to honor the birthday child, and support the proud and beaming parents. The reality, though, that many parents may not realize until they experience it is that the 1st birthday of your child is not the only birthday you will cherish. Every single year, your heart strings are pulled as you realize your baby is slowly slipping out of your hands and is growing up. And thankfully so, growing up means they are healthy and thriving little humans that will get to experience the full extent of life. However, it doesn’t make it any easier to say goodbye to one age, and welcome an age a year older. Everyone told you to take it all in, enjoy the precious moments with your children, as you will blink an eye and they will be graduating from high school. No one can comprehend how fast it goes until they become a parent. The days are long, but those years flutter by far too quickly than you ever imagined. For those dads out there who said they would never play dress up, or attend an elaborate at-home tea party as royalty does, you now know how wrong you were pre-kids. Your little girl lives in a world of childhood ignorance and innocence, and wants to grow up as a princess, twirling around in her fancy ball gown and serving her guests pastries and pretend tea. And when she puts that silly, way-too-shiny crown on her head, you totally buy into it and go along for the ride. Whatever makes her smile and her eyes light up is something you will always partake in. Run Jump-n-Play is a family oriented business whose employees understand the many emotions that parents experience on their child’s birthday. We also understand that parents are busy and want to have someone else cover all of the minute details that will allow you to fully enjoy the experience. Every party comes with a fully-trained party host who from the second you walk in the door, will help your party run smoothly and flawlessly. They will coordinate with you for any specific decorations, or set-up directions you may have, and implement those for you while you are out on our playground and inflatables enjoying the day with your birthday child. All you, as the parent, have to do is have fun with your child, mingle with all of the guests and take a lot of pictures! However, the logistical components to a birthday party are not the only thing that matters. In fact, to some extent, they are the least important that you won’t remember in 10 years. 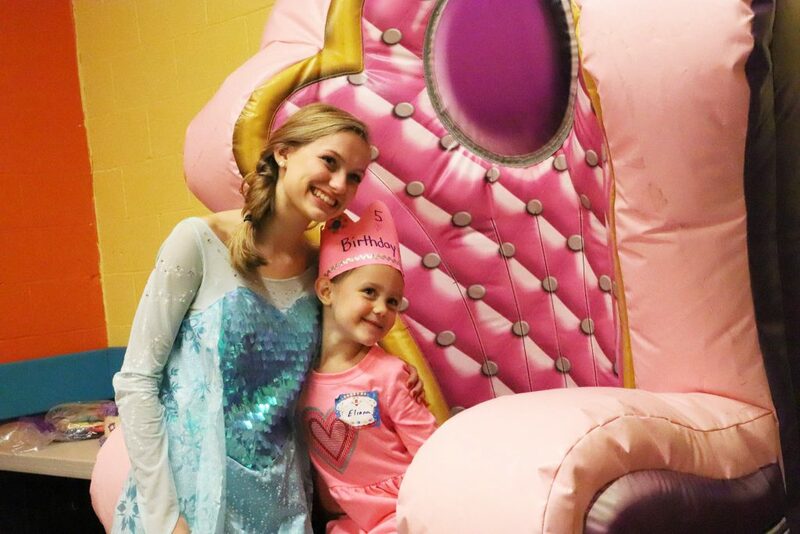 Run Jump-n-Play offers a Princess Themed Birthday Party (click here for details)that will transform a regular event into a magical and magnificent moment. Instead of your little girl playing pretend in your home, let her live out her dreams with all of her family and friends at Run Jump-n-Play. She can wear her favorite ballgown, her shiniest crown and her fanciest shoes to host an actual magical event that she always dreams of while at home. You can even arrange to have a princess character attend the party to surprise her! You won’t remember the plates, the cake flavor or drinks. But you will surely remember the absolute joy and magic that your little girl is experiencing at her special birthday party. Call Run Jump-n-Play for more details on how you can transform a regular birthday party to one of sparkles and magic for your special princess. Your little girl won’t always want to dress up like a princess, for one day she will put on those soccer cleats or roll her eyes at you when you walk in the room. Take advantage of the magic now and make a day you and your family won’t ever forget!